Significant effort went into bringing axes3d to feature-parity with regular axes objects for version 1.1.0. However, more work remains. Please report any functions that do not behave as expected as a bug. In addition, help and patches would be greatly appreciated! 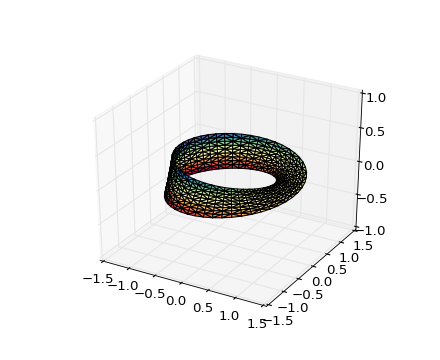 Module containing Axes3D, an object which can plot 3D objects on a 2D matplotlib figure. 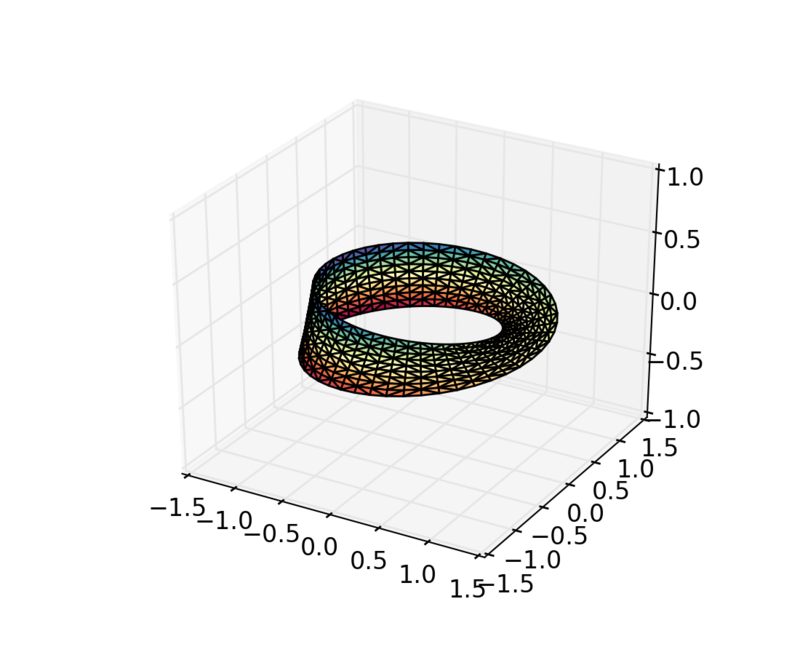 Add a 3D collection object to the plot. 2D collection types are converted to a 3D version by modifying the object and adding z coordinate information. Convenience method for simple axis view autoscaling. See matplotlib.axes.Axes.autoscale() for full explanation. Note that this function behaves the same, but for all three axes. Therfore, ‘z’ can be passed for axis, and ‘both’ applies to all three axes. New in version 1.1.0: This function was added, but not tested. Please report any bugs. Autoscale the view limits using the data limits. See matplotlib.axes.Axes.autoscale_view() for documentation. Note that this function applies to the 3D axes, and as such adds the scalez to the function arguments. Changed in version 1.1.0: Function signature was changed to better match the 2D version. tight is now explicitly a kwarg and placed first. Changed in version 1.2.1: This is now fully functional. left The x coordinates of the left sides of the bars. height The height of the bars. zs Z coordinate of bars, if one value is specified they will all be placed at the same z.
zdir Which direction to use as z (‘x’, ‘y’ or ‘z’) when plotting a 2D set. Keyword arguments are passed onto bar(). Generate a 3D bar, or multiple bars. When generating multiple bars, x, y, z have to be arrays. dx, dy, dz can be arrays or scalars. A single color value, to color all bars the same color. An array of colors of length N bars, to color each bar independently. An array of colors of length 6, to color the faces of the bars similarly. An array of colors of length 6 * N bars, to color each face independently. Return True if this axes supports the pan/zoom button functionality. 3D axes objects do not use the pan/zoom button. Return True if this axes supports the zoom box button functionality. 3D axes objects do not use the zoom box button. This function is currently not implemented for 3D axes. Returns None. Create a 3D contour plot. 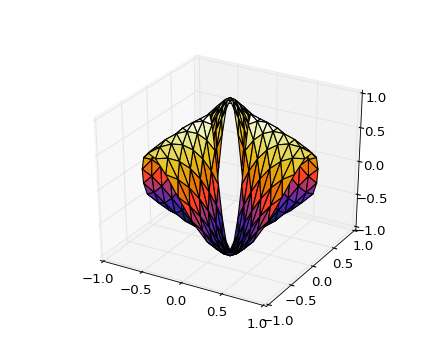 Create a 3D contourf plot. Changed in version 1.1.0: The zdir and offset kwargs were added. Given the 2D view coordinates attempt to guess a 3D coordinate. Looks for the nearest edge to the point and then assumes that the point is at the same z location as the nearest point on the edge. Get whether axis below is true or not. New in version 1.1.0: This function was added for completeness. Create the projection matrix from the current viewing position. dist is the distance of the eye viewing point from the object point. Changed in version 1.1.0: This function now correctly refers to the 3D y-limits. Get the z-label text string. Minor ticks are not supported. This function was added only for completeness. Get ztick labels as a list of Text instances. See matplotlib.axes.Axes.get_yticklabels() for more details. Minor ticks are not supported. Get ztick lines as a list of Line2D instances. Note that this function is provided merely for completeness. These lines are re-calculated as the display changes. Return the z ticks as a list of locations See matplotlib.axes.Axes.get_yticks() for more details. Set / unset 3D grid. Currently, this function does not behave the same as matplotlib.axes.Axes.grid(), but it is intended to eventually support that behavior. Changed in version 1.1.0: This function was changed, but not tested. Please report any bugs. Convenience method for controlling tick locators. See matplotlib.axes.Axes.locator_params() for full documentation Note that this is for Axes3D objects, therefore, setting axis to ‘both’ will result in the parameters being set for all three axes. Also, axis can also take a value of ‘z’ to apply parameters to the z axis. Convenience method to set or retrieve autoscaling margins. All forms above set the xmargin, ymargin and zmargin parameters. All keyword parameters are optional. A single argument specifies xmargin, ymargin and zmargin. The tight parameter is passed to autoscale_view(), which is executed after a margin is changed; the default here is True, on the assumption that when margins are specified, no additional padding to match tick marks is usually desired. Setting tight to None will preserve the previous setting. Specifying any margin changes only the autoscaling; for example, if xmargin is not None, then xmargin times the X data interval will be added to each end of that interval before it is used in autoscaling. Initializes mouse button callbacks to enable 3D rotation of the axes. Also optionally sets the mouse buttons for 3D rotation and zooming. rotate_btn The integer or list of integers specifying which mouse button or buttons to use for 3D rotation of the axes. Default = 1.
zoom_btn The integer or list of integers specifying which mouse button or buttons to use to zoom the 3D axes. Default = 3. Plot 2D or 3D data. zs z value(s), either one for all points or one for each point. By default it will be colored in shades of a solid color, but it also supports color mapping by supplying the cmap argument. The rstride and cstride kwargs set the stride used to sample the input data to generate the graph. If 1k by 1k arrays are passed in the default values for the strides will result in a 100x100 grid being plotted. cmap A colormap for the surface patches. where Z is the array of values to contour, one per point in the triangulation. New in version 1.2.0: This plotting function was added for the v1.2.0 release. The rstride and cstride kwargs set the stride used to sample the input data to generate the graph. Keyword arguments are passed on to LineCollection. Plot a 3D field of arrows. The arguments could be array-like or scalars, so long as they they can be broadcast together. The arguments can also be masked arrays. If an element in any of argument is masked, then that corresponding quiver element will not be plotted. xs, ys Positions of data points. zs Either an array of the same length as xs and ys or a single value to place all points in the same plane. Default is 0.
s size in points^2. It is a scalar or an array of the same length as x and y.
c a color. c can be a single color format string, or a sequence of color specifications of length N, or a sequence of N numbers to be mapped to colors using the cmap and norm specified via kwargs (see below). Note that c should not be a single numeric RGB or RGBA sequence because that is indistinguishable from an array of values to be colormapped. c can be a 2-D array in which the rows are RGB or RGBA, however. depthshade Whether or not to shade the scatter markers to give the appearance of depth. Default is True. Keyword arguments are passed on to scatter(). Set a title for the axes. Set one of the three available axes titles. The available titles are positioned above the axes in the center, flush with the left edge, and flush with the right edge. Other keyword arguments are text properties, see Text for a list of valid text properties. 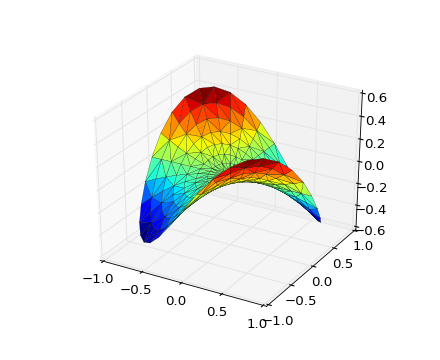 See matplotlib.axes.Axes.set_xlim() for full documentation. will place 8 logarithmically spaced minor ticks between each major tick. The range (-x, x) within which the plot is linear (to avoid having the plot go to infinity around zero). This allows the linear range (-linthresh to linthresh) to be stretched relative to the logarithmic range. Its value is the number of decades to use for each half of the linear range. For example, when linscale == 1.0 (the default), the space used for the positive and negative halves of the linear range will be equal to one decade in the logarithmic range. See matplotlib.axes.Axes.set_ylim() for full documentation. Set the lower and upper numerical bounds of the z-axis. This method will honor axes inversion regardless of parameter order. It will not change the _autoscaleZon attribute. Set zlabel. See doc for set_ylabel() for description. Currently, labelpad does not have an effect on the labels. Set padding of Z data limits prior to autoscaling. m times the data interval will be added to each end of that interval before it is used in autoscaling. Currently, Axes3D objects only supports linear scales. Other scales may or may not work, and support for these is improving with each release. Set z-axis tick labels. See matplotlib.axes.Axes.set_yticklabels() for more details. Minor ticks are not supported by Axes3D objects. Set z-axis tick locations. See matplotlib.axes.Axes.set_yticks() for more details. Add text to the plot. kwargs will be passed on to Axes.text, except for the zdir keyword, which sets the direction to be used as the z direction. Add text to the axes. Add text in string s to axis at location x, y, data coordinates. A dictionary to override the default text properties. If fontdict is None, the defaults are determined by your rc parameters. Convenience method for changing the appearance of ticks and tick labels. See matplotlib.axes.Axes.tick_params() for more complete documentation. The only difference is that setting axis to ‘both’ will mean that the settings are applied to all three axes. Also, the axis parameter also accepts a value of ‘z’, which would mean to apply to only the z-axis. Also, because of how Axes3D objects are drawn very differently from regular 2D axes, some of these settings may have ambiguous meaning. For simplicity, the ‘z’ axis will accept settings as if it was like the ‘y’ axis. While this function is currently implemented, the core part of the Axes3D object may ignore some of these settings. Future releases will fix this. Priority will be given to those who file bugs. Convenience method for manipulating the ScalarFormatter used by default for linear axes in Axed3D objects. See matplotlib.axes.Axes.ticklabel_format() for full documentation. Note that this version applies to all three axes of the Axes3D object. Therefore, the axis argument will also accept a value of ‘z’ and the value of ‘both’ will apply to all three axes. EXPERIMENTAL: This method currently produces incorrect output due to a longstanding bug in 3D PolyCollection rendering. Set the elevation and azimuth of the axes. This can be used to rotate the axes programatically. ‘elev’ stores the elevation angle in the z plane. ‘azim’ stores the azimuth angle in the x,y plane. if elev or azim are None (default), then the initial value is used which was specified in the Axes3D constructor. Sets up z-axis ticks and labels that treat the z data as dates. tz is a timezone string or tzinfo instance. Defaults to rc value. This function is merely provided for completeness. Axes3D objects do not officially support dates for ticks, and so this may or may not work as expected. Returns True if the z-axis is inverted. Return a tuple X, Y, Z with a test data set. Historically, axis3d has suffered from having hard-coded constants controlling the look and feel of the 3D plot. This precluded user level adjustments such as label spacing, font colors and panel colors. For version 1.1.0, these constants have been consolidated into a single private member dictionary, self._axinfo, for the axis object. This is intended only as a stop-gap measure to allow user-level customization, but it is not intended to be permanent. Whether to rotate the axis label: True, False or None. If set to None the label will be rotated if longer than 4 chars. Return a coordinate that is moved by “deltas” away from the center. Update tick line and label position and style. Module containing 3D artist code and functions to convert 2D artists into 3D versions which can be added to an Axes3D. Keyword arguments are passed onto Line2D(). A collection of 3D lines. Keyword arguments are passed onto LineCollection(). Project the points according to renderer matrix. Set the position to use for z-sorting. A collection of 3D patches. Create a collection of flat 3D patches with its normal vector pointed in zdir direction, and located at zs on the zdir axis. ‘zs’ can be a scalar or an array-like of the same length as the number of patches in the collection. Constructor arguments are the same as for PatchCollection. In addition, keywords zs=0 and zdir=’z’ are available. Also, the keyword argument “depthshade” is available to indicate whether or not to shade the patches in order to give the appearance of depth (default is True). This is typically desired in scatter plots. A collection of 3D paths. Create a collection of flat 3D paths with its normal vector pointed in zdir direction, and located at zs on the zdir axis. ‘zs’ can be a scalar or an array-like of the same length as the number of paths in the collection. Constructor arguments are the same as for PathCollection. In addition, keywords zs=0 and zdir=’z’ are available. A collection of 3D polygons. verts should contain 3D coordinates. Keyword arguments: zsort, see set_zsort for options. Note that this class does a bit of magic with the _facecolors and _edgecolors properties. Perform the 3D projection for this object. Set the alpha tranparencies of the collection. alpha must be a float or None. Text object with 3D position and (in the future) direction. Keyword arguments are passed onto Text(). Return a list of vertices for the path of a patch. Reorder coordinates so that 2D xs, ys can be plotted in the plane orthogonal to zdir. zdir is normally x, y or z. However, if zdir starts with a ‘-‘ it is interpreted as a compensation for rotate_axes. Convert a 2D line to 3D. Convert a LineCollection to a Line3DCollection object. Convert a Patch to a Patch3D object. Convert a PatchCollection into a Patch3DCollection object (or a PathCollection into a Path3DCollection object). collection along the zdir axis. Defaults to 0.
zdir The axis in which to place the patches. Default is “z”. depthshade Whether to shade the patches to give a sense of depth. Convert a path to a 3D segment. Convert a PathPatch to a PathPatch3D object. Convert paths from a collection object to 3D segments. Convert a PolyCollection to a Poly3DCollection object. Convert a Text to a Text3D object.